At the invitation of Russian Deputy Prime Minster Dmitry Rogozin, Vice Premier Wang Yang of the State Council will attend the fourth International Arctic Forum "Arctic: Territory of Dialogue" in Arkhangelsk, Russia and co-host the meeting of the Joint Commission for the Regular Prime Ministers' Meetings of China and Russia with Deputy Prime Minster Dmitry Rogozin from March 28 to 31. Q: Recently, China has received visits by the Saudi Arabian King and the Israeli Prime Minister. Some western media believed that China, who in the past played not that a big role on the Middle East issue, is now more deeply involved in the Middle East affairs. What is your comment? A: China has never been an onlooker when it comes to the Middle East affairs. We are committed to promoting peace and stability in the Middle East. Upholding an objective and unbiased position, China has been playing a constructive role in moving such hotspot issues as the Palestine-Israel issue, the Iranian nuclear issue, the Syrian issue towards political settlement and promoting peace talks. As President Xi Jinping said, for many of the issues facing the Middle East, the root lies in development, and the solution can only be sought from development as well. During Saudi Arabian King Salman and Israeli Prime Minister Netanyahu's visits, China reached important consensus with them on deepening practical cooperation in various fields. Their visits yielded fruitful outcomes. We would like to cooperate with countries along the Belt and Road, including the Middle East countries such as Saudi Arabia and Israel, to build the Belt and Road together, share opportunities amid opening-up and strengthen cooperation amid connectivity. We will, as always, continue to contribute constructively to long-standing peace and stability in the Middle East, and strengthen our mutually beneficial cooperation with Middle East countries. Q: First, it is reported that US Secretary of State Tillerson expressed his concerns over China's opposition to THAAD during his visit to China. What is your position? Second, did he mention "secondary boycott" regarding the Korean nuclear issue? A: On your first question, we have released readouts about Secretary of State Tillerson's visit. When Foreign Minister Wang Yi met with Secretary Tillerson, he made clear China's consistent position on opposing the United States' deployment of THAAD in the ROK. On your second question, our position is consistent and clear. We consistently oppose levying unilateral sanctions on other countries by any country in accordance with its domestic laws. Q: First, an official of Sansha City said that the city plans to build an environmental monitoring station on Huangyan Dao. Can you confirm? The Philippines has sent a formal request for clarification on this. What is your response? The second question is about the Agricultural Bank of China's account which was used to fund local ethnic armed groups in Myanmar, which they say will no longer be accepting funds. Has China requested the Bank to close this account or did China receive a request from Myanmar to close the account? A: On your first question, China attaches high importance to marine ecological and environmental protection in the South China Sea. This is for sure. We have checked with relevant authorities that the recent reports about building an environmental monitoring station on Huangyan Dao are false. There is no such a thing. Regarding Huangyan Dao, China's position is consistent and clear. Meanwhile, China places great importance on its relationship with the Philippines and cherishes the sound momentum China-Philippines relations are enjoying now. We will remain committed to pursuing sound, steady and rapid development of China-Philippines relations. On your second question, I am not aware of the specifics. China's position is very clear. We will never interfere in the domestic affairs of other countries, and we respect the sovereign independence and territorial integrity of Myanmar. 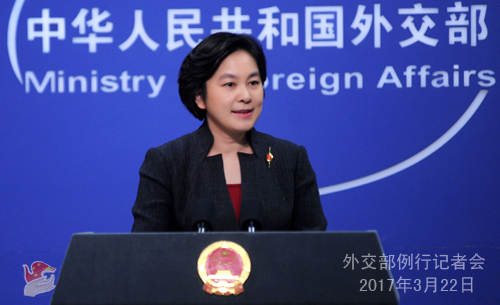 We will not allow any organization or individual to use Chinese territories for activities disruptive to China-Myanmar relations and border stability. Any actions in violation of laws and regulations will be dealt with in accordance with laws and regulations. Q: The US and the ROK confirmed that the DPRK today test-fired another missile which failed seconds later. Can you confirm? Some people deem the test as the DPRK's rejection of China's "suspension for suspension" proposal. What is your comment? A: We have noted relevant reports and are concerned about recent developments of the Korean Peninsula situation. The situation there is already very tense, almost approaching a tipping point. We call on relevant parties to remain calm, exercise restraint, and avoid provocative and risky actions that may lead to misjudgment. We hope that all parties can be responsible and do more to alleviate tensions. The Korean nuclear issue dates back long ago. It is very intricate and complex. Its crux is the disagreements, deep-seated hostility and big deficits of mutual trust between the DPRK on the one hand and the US and the ROK on the other. As a Chinese saying goes,a knot should be untied by the one who tied it in the first place. We believe that any unilateral moves to pursue the absolute security of oneself out of its own interests would only further complicate the matter. Such moves would not deliver genuine security and could make relevant goals more elusive. We must address both the symptoms and the root causes and find a solution that accommodates the legitimate security concerns of all parties. What we have proposed is a "dual-track approach" that realizes the denuclearization of the Peninsula and the transition from armistice to a peace mechanism in parallel. To find a breakthrough for that, we also put forward a "suspension for suspension". 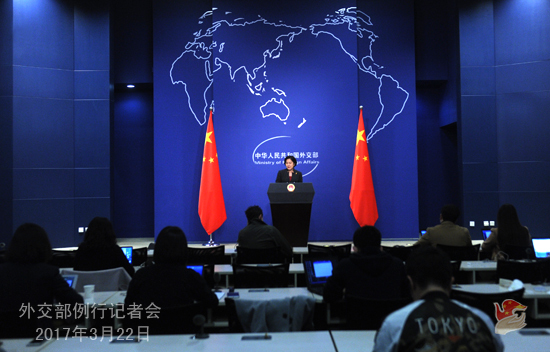 China's proposal is objective, unbiased, legitimate and reasonable. It is the right one to help the Korean nuclear issue out of the current predicament and is worth high attention and serious consideration from all parties. Q: The fifth round of Geneva peace talks on the Syrian issue will be held on March 23. Will China send a delegation to the meeting? What is your expectation for this round of talks? A: China welcomes the fifth round of Geneva peace talks on the Syrian issue which will be held as scheduled by the UN. The Syrian government and the opposition will for the first time get together to negotiate topics they agreed upon. To resolve the Syrian issue is like running a long race. Identifying clear topics for negotiations is like setting the direction for the runners, which is essential for a good start. Pulling a long race also needs sound pace and speed. For the Syrian government and the opposition, they should seize the opportunity and redouble their efforts. They should proceed from the easier parts and gradually move on to more difficult ones. Following this principle, the negotiation process would not lose speed or deviate from its track. For negotiations on the four baskets, namely transitional governance, a new constitution, elections and counter-terrorism, the negotiating parties need to pursue them in parallel in their talks so that some early harvests can be reached as soon as possible and the positive momentum for dialogues and negotiations consolidated. A long-distance race also needs logistic support. It is imperative for the international community to support and advance the peace talks, rally around the mediation efforts of the UN, and create favorable conditions for the negotiations. Special Envoy Xie Xiaoyan of the Chinese government on Syria will lead a delegation to this round of talks to further promote peace talks. 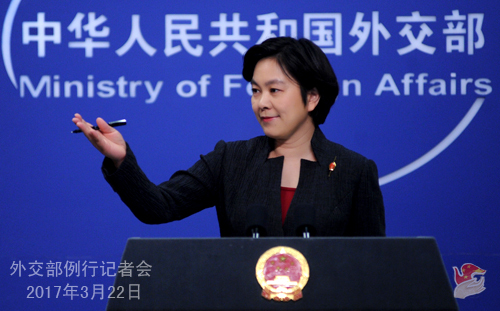 China will continue to make positive and constructive contributions to the political settlement of the Syrian issue. Q: US Secretary of State Tillerson twice stressed in China last week that China and the US should uphold non-conflict, non-confrontation, mutual respect and win-win cooperation. These remarks drew extensive attention. Some American scholars and former senior officials criticized Mr. Tillerson for his remarks which were described by certain media as "a diplomatic victory" for China or endorsement for China's core interests. What is your comment? A: During Secretary of State Tillerson's stay in China, the two sides arrived at a clear consensus on ensuring a sound development of China-US relations at a new starting point in the spirit of non-conflict, non-confrontation, mutual respect and win-win cooperation. It should not be interpreted as a victory for any party. It is just the right way for China and the United States, two major countries, to get along with each other. Non-conflict, non-confrontation, mutual respect and win-win cooperation summarizes the reason for the steady growth of China-US ties in recent years and is worth carrying forward and being further developed. We would like to enhance communication, mutual understanding and mutual trust with the US so as to properly handle differences, expand bilateral, regional, and international cooperation, and elevate China-US relations to a greater height at a new starting point. Q: Yesterday you said that it needs scientific analysis to prove whether China's air pollution problem has affected neighboring countries or not. Premier Li Keqiang, when meeting the press, also said that there are special causes for northern China's smog issue. What does "special" mean? A: For such a specific issue requiring specialized knowledge, you need to ask competent authorities. I want to reiterate that the Chinese government is very resolute and has put in enormous efforts in environmental management and protection which nevertheless is a process that takes time. Relevant departments in China are ready to enhance cooperation on environmental protection with the international community, including our neighbors. Q: Can you confirm the suspension of imports of Brazilian meat products? What is China's comment? A: I gave an answer to this question yesterday. China is concerned about the quality issue surrounding some meat products from Brazil. The competent authorities in China have taken preventive and provisional measures of protection to ensure the safety of Chinese consumers. We hope that the Brazilian side can thoroughly investigate into this issue with openness and transparency, inform China of the investigation results in time, and take stricter measures to ensure safety of products exported to China. We hope that we can enhance communication and coordination in the spirit of equality and mutual benefit and properly handle problems arising during cooperation.